That’s great news and an even better reason to celebrate. However, along with the excitement of a new venture comes serious anxiety. What can overshadow a new business owner’s elation? Concerns about money. Many of us worry about money and finances on a regular, if not daily, basis. But those concerns take on a new depth where starting a business is concerned. Fortunately, you can lessen those fears by learning about the expenses you’ll face as a budding entrepreneur and planning for them. Stay tuned as we discuss the basic expenses when starting a business and provide you with resources for planning. At this point, you’re probably thinking, “My expenses can’t be the same as everyone else’s, my business is unique!” And you’re right — sort of. When you start a business, chances are it’ll fall into one of the following categories: Online Business, Brick-and-Mortar, or Service Provider. Each type has its own unique costs, challenges, and rewards. 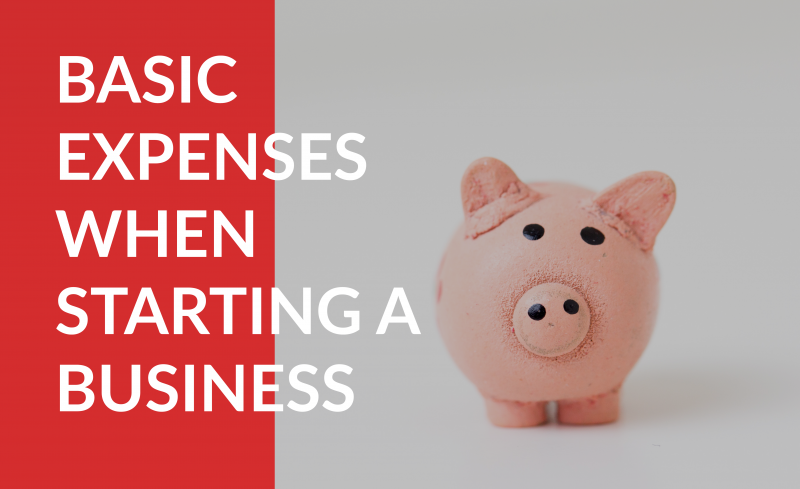 Here, we’ll list the expenses that will likely be common to all three business types. Legal Fees – Legal expenses can include things like incorporation fees, licenses, and permits. These fees are usually standard and can be anticipated. Technology – It’s not easy to run a business for a luddite. You’re going to need technology and it’s a good idea to prepare for those costs. Set aside funds for things like: a good computer, a website, and software to help you manage your customers and sales. Office or retail space – Obviously, a brick-and-mortar can’t exist without a physical location; but don’t skip over this as a service provider or online business. Unless you plan on working from home every day, you need to account for the cost of a work space for you and any potential employees. Employees – If you hire employees you’ll need to pay them and have money for payroll taxes, too. If you plan on offering your employees health insurance then that will be an added expense. Marketing and Consultations – Your business doesn’t exist in a bubble. To be successful, you’ll need customers or clients to bring in revenue. Plan on having funds to execute a marketing strategy. It doesn’t have to be over-the-top (so no jumping in with a nationally syndicated commercial on prime time TV.) If marketing isn’t your forte you should consider hiring a consultant who has experience with marketing small businesses. As we stated earlier, every business will face its own unique expenses in addition to those listed above. The Small Business Administration created a helpful budgeting worksheet that breaks down additional expenses into two columns: one-time expenses and monthly, or recurring, expenses. Keep this document handy. Plan on starting your business with six months’ worth of expenses at hand. This is a great tip from the folks at Fundera. A lot can happen in six months, especially as you embark on this exciting business journey! Don’t count on customers flooding through your doors (either physical or digital) in the early days as a way to cover business expenses. We have all the faith in the world that you can be successful and will end up with more customers than you know what to do with, but don’t push your luck as you get started. According to a study done by Jessie Hagen at U.S. Bank, 82% of small business fail because they’ve mismanaged their cash flow. If you’re going to be a statistic, aim for a better one. Planning and preparation will help ease you through those first six months and beyond. If you don’t have six months worth of expenses at hand, don’t panic. We’ll let you in on a little secret — you’re in good company. The vast majority of people starting small businesses don’t have that kind of money in liquid assets or in savings. Depending on where you live, you’ll have a variety of lending options. You can get a loan from large national banks, smaller banks and credit unions, or even third party lenders. Make sure to read the terms of the loan and ask questions if you don’t understand what you’re signing. How much money can you expect to take out as a loan? Various things can affect the amount of your loan, like your personal and business credit history. However, we can look at reported average loan amounts, differentiated based on lender type, to get a ballpark number. Do your research before taking out a loan to get the best financing and so that you don’t end up with a loan that’s insufficient to cover your expenses. Starting a small business is no easy feat, but it’s certainly rewarding, and there’s no better time to start than now. According to a U.S. Bank Survey, economic uncertainty is no longer small businesses #1 concern. So what are you waiting for? Crack open those spreadsheets (or paper and pencil if that’s what you prefer) and figure out what your exact expenses will be. Once you’ve determined that number you can start saving or seek out a loan. Do you have any other tips or insights for budding entrepreneurs and small business owners? Share them in the comments, we’d love to hear them.